The mystery painting that held my attention for many weeks finally reached its new home! 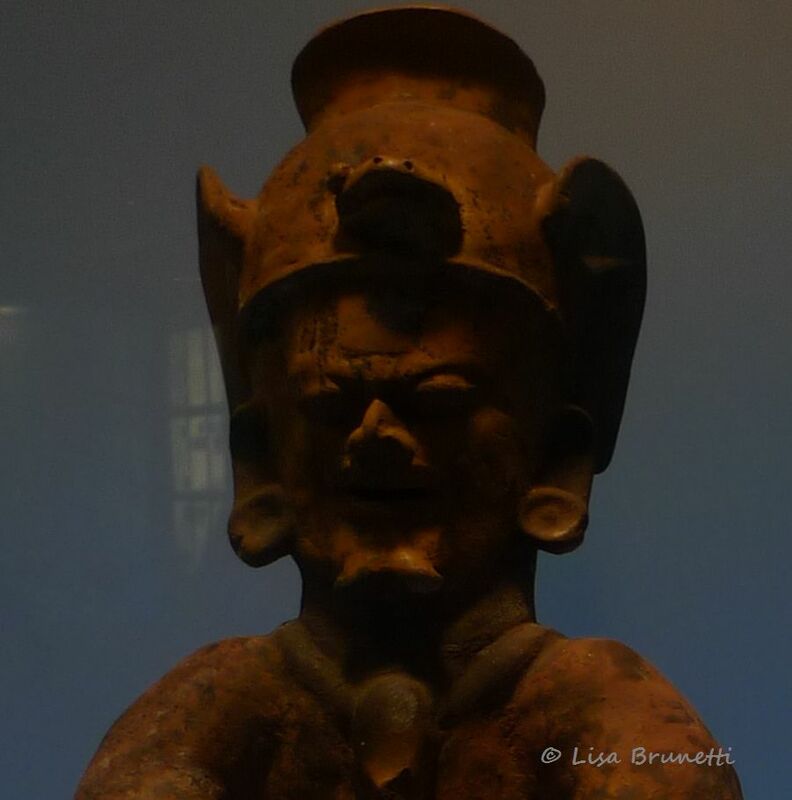 Patricia Adams Farmer gave readers a sneak peek in her amazing feature, “The Totalmente Zen Art of Lisa Brunetti” Thanks again, Patricia, and thanks to all of you who visited her column and left such thoughtful comments. 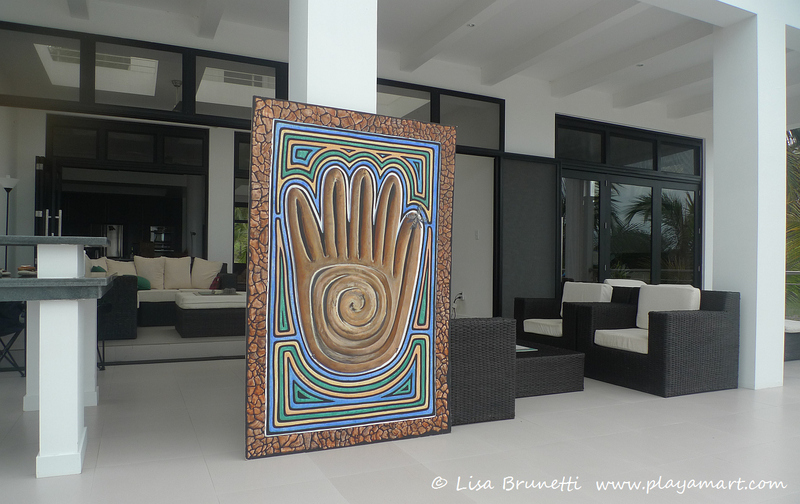 New clients from the Jama area especially liked my graphic six-foot tall painting, Mano Swirl, that belongs to the Museo Bahia de Caraquez (Ecuador) and depicts a pre-Columbian relic from the area. Anyone who walks the beaches of the Jama area, will come away with pottery fragments from the Jama Coaque culture. 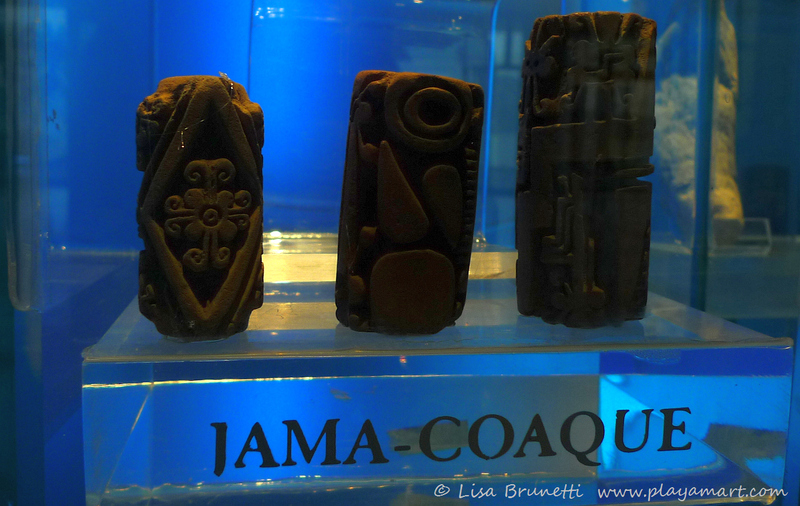 The Jama Coaque Indians left behind a legacy of amazing artifacts. 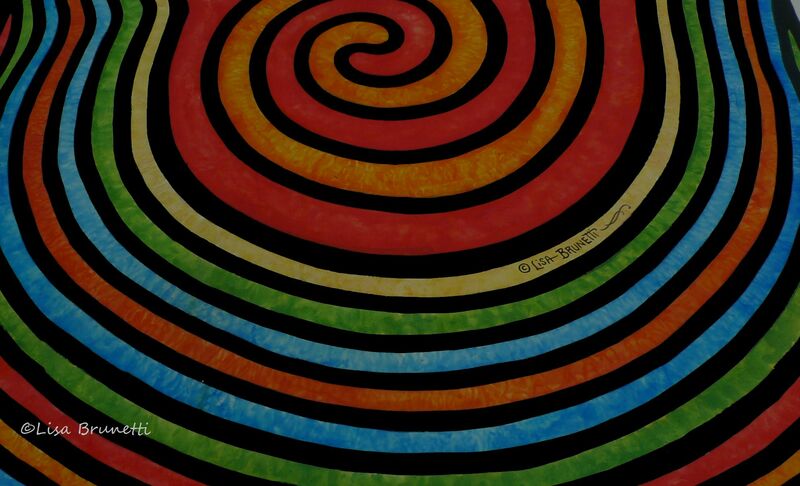 The hand and the swirl patterns are often associated with their culture. Sellos were most likely used for rolling designs on textiles and skin. The inspiration for the current painting came from a small “sello” artifact from the Casa del Alabado Museum collection in Quito Ecuador. 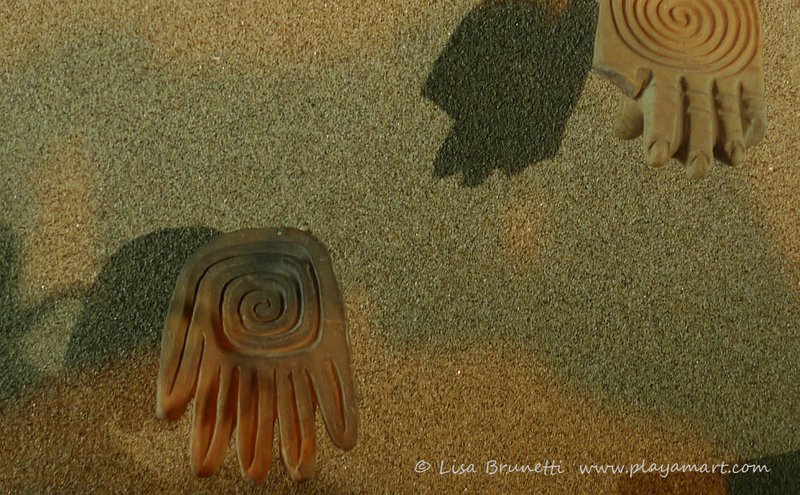 The Indians most likely used sellos to stamp patterns onto bodies and textiles. We decided to go with a scientific likeness for this “Jama Coaque” painting. I often placed the painting on the floor and my computer on the painting for easy reference of the museum image. Although the borders of my mola paintings are deliberately black and uninteresting, this one called for a perimeter of shards typically found on the nearby beaches. Several hours into the border, I wondered if I’d lost my mind. 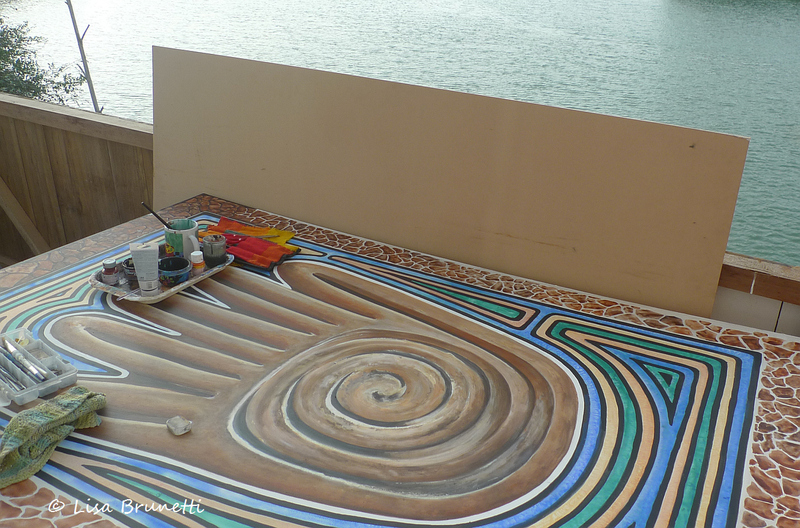 (That also happened a few years ago in Belize, when I added a border around a hand-painted floor!) Like in Belize, I knew that the border might take as long as the subject, but it was worth the effort. Nice work environment, don’t you think? We transferred the painting to its new home on New Year’s Eve. Patricia’s story (Here) captures the mood of that lovely gathering of people who helped with the border! (Thanks, Lesli, for the following photos that captured the synergy at work!) The painting was commissioned by friends Lesli and Becky, who live in the petite community of El Matal, Ecuador. Click on any image below for a slideshow. 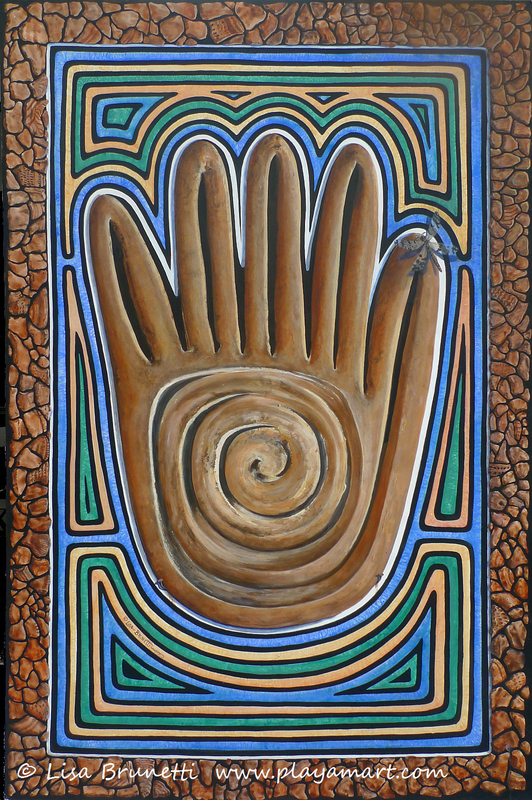 Detail: Mano de la Paz – Original Painting influenced by an artifact in Casa de Alabado/Quito Ecuador. Muchas Grrrrrrrrrracias, everyone, for your beautiful comments on the last post about the painting; thanks also, for spending time on Patricia Farmer’s column. She’s a very talented writer and deserves a great audience! Like a proud parent, I present to you the first of the new series. Mano de la Paz takes the stage in its new home! Another instance when “Like” doesn’t cut it!!! LOVE💓💗💜💙💛. Need I say more!!!! yes, it is a dragon fly that flew through their house, so it is a very special dragon fly! So much fun to be included in your creative process. How do you sustain yourself when painting? By eating fruit and nuts? You must require lots of energy. ja! because it’s extremely important to have an ultra-steady hand, i discipline myself to stop and eat throughout the painting process. with ‘intelligence’and attention to nutrition, i eat just enough not to make me sleepy, but enough to nourish my body. every second or third hour, i’ll eat something (and sit back and eye he painting!) i especially enjoy grapefruit, when available (8 for one dollar!) – bananas are always easy; each morning i pick hibiscus and mint and brew a ‘tea’ and drink that throughout the day. with lemon or maracuya. one of my favorite fast fixes is to saute an onion and a pepper, add shredded red cabbage and shredded carrots; cook for about one minute more, add a diced tomato just long enough to get it warm.. then i stir a can of tuna… that’s good for two or three breaks. lentils are fast and easy and nutritious to cook before i start painting… lentil cakes are yummy later in the day when i’ve earned and need a physical break from painting. many times i put something in the crock pot. strong paintings like this one exhaust me, and later i can stand back and understand why – all of my energy goes into the painting. in costa rica, my dear friend marie often invited me to dinner at their house, and i often shrugged and said that i suspected by the end of the day i’d be on a roll and wouldn’t want to stop… at the end of the day, that sweet angel would drive up, come inside and say, ‘don’t get up, dinner’s here when you need it..’ and then she’d quietly leave. she is a gourmet cook, so there was always some amazing culinary treat patiently waiting on the counter or refrigerator! that’s a true friend! Yes, the container was bone dry and very hot! It’s been raining since, so I’ve studk to drinking water! I am glad you keep me company in forgetting what’s on the boil! Love it !! And the shards were worth every hour of painting . The best things about artists are the ability to bring people together! Wonderful! thanks! it’s a natural gift, though it’s taken years, and experience to feel comfortable stepping forward into that role. getting older has its problems (the body passes its optimum) but the benefits (wisdom is one) always trump the negative points! it’s our duty to pass on what we’ve learned! Stepping into that role is tough! we wean into it gradually. you’ve a head start and will be there for sure, but perhaps you already are! I love your work! It’s good to have you back. I gather you had lost electricity again? buenos dias! thank you! you and several others have mentioned they noted my absence, and it truly feels good to know there’s a buddy system at work – even (especially?) in the cyberspace world! i just opened your post, ‘phil is troubled’ and am about to work backwards between replying to comments! Have no adjectives Lisa! I can imagine the time and effort required to paint this masterpiece and how completely satisfying it must feel! Stunning! Can’t wait to see your work in person, Lisa. Hope you’ve made it to Cuenca. hey, thanks! i’m glad you liked it! my cuenca trip has been postponed. i’m home now and catching up on lots of things. we’re also getting a lot of rain! today/tonight has been the most so far. do you have a travel date/itinerary? Pottery inspiration that was a coincidence, I will put a photo of a piece of pottery I made in my next post. Even if it is inapproprate for the subject of the post. I think you will like it. I love the colours in your paintings so warm and friendly. thanks! i look forward to seeing more of your creations.! That is a beautiful painting it shows such depth I love the shards around the border and what a lovely interactive way of painting. I would love to be part of one of those group paintings. 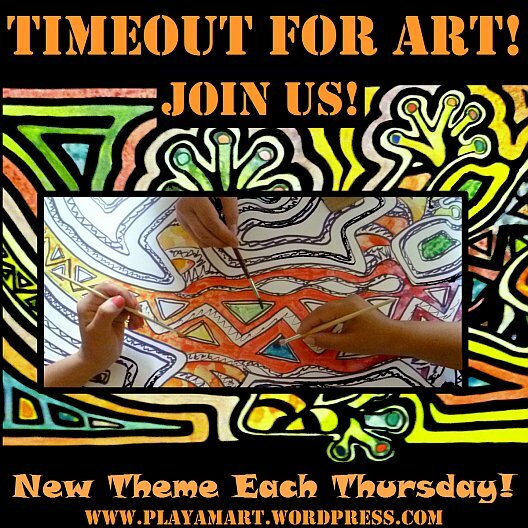 What a masterpiece…created through collaboration! It ‘s gorgeous, thanks for sharing the story and photos behind this creation! Thanks for sharing a wonderful, creative journey. Congratulations – the energy has gone round and round and it’s time to rest a bit, no? I still love the photo of the painting on the terrace so much. Seeing the sea beyond, the tools, and the work, makes a complete picture. thanks! I’m glad that you liked the latest! you should consider painting those heliconias on the wall! try a corner, or the edge of a doorway! Thanks! Several people have posted some culinary features, and wow, when i’m painting and not cooking and see those – yes! i want one of each! Every work is a priceless treasure. Beautiful! Powerful image and it vibrates energy too. Thanks! 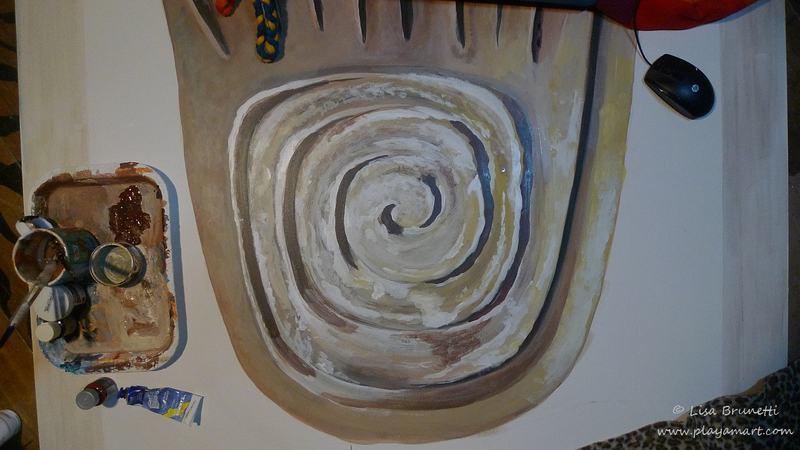 I am working on a ‘cousin’ painting the same size of a second artifact that was in the same museum… this hand with spiral is in bright contemporary colors and keeps tricking my eyes.. it’s full of energy! Oh, I can’t believe I missed this fantastic article! I went to read the article that was published on you and even commented, but never came back to your post! Geez ~ here is what I love – when you invite others at a gathering to participate in completing the painting by picking up a brush and paint along side everyone else. This is fantastic! It’s wonderful to see and learn about – there is a lesson here. Everyone looks more than happy, they seem to have their soul filled. Your painting is magical and truly a work of art. I see what you mean about the border, but oh doesn’t this just compliment the buyers living quarters – congratulations. you are kind and dear, amiga, and i hope that one day our paths cross in person! i am glad that you approve!!! Stunning! I love the quote from the article link above by Patricia. We also, leave tiny bits of our souls to everyone we come in contact with. Lovely! thank you so muchl, and thanks for turning back the archives and reminding me of a great time with friends. Patricia is a very talented writer, and yes, we do leave traces of ourselves behind.